“Kether is the highest of all and herein scintillates the Divine White Brilliance. 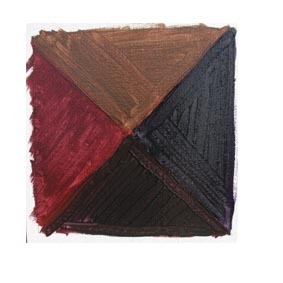 Chokmah is gray, the mixture of colors, Binah is black, the absorption of colors. And thus is the Supernal triad completed. “The beams of Chesed and Tiphareth meet in Netzach and yield Green. The beams of Geburah and Tiphareth meet in Hod, and yield a Tawny orange. The beams of Chesed and Geburah fall in Yesod and yield Purple. And thus is the third triad completed. 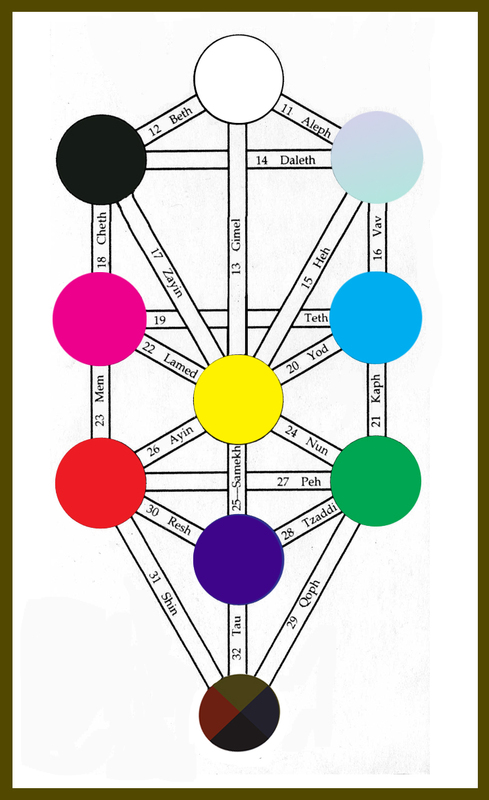 In consideration of the nature of the true Primary Colours, it seems important to re-examine the Minutum Mundum diagram, wherein the Sephiroth of Chesed, Geburah and Tiphareth reflect, according to Regardie’s description, the root colours of blue, red and yellow. The word ‘root’ surely must correspond to the word ‘primary’. 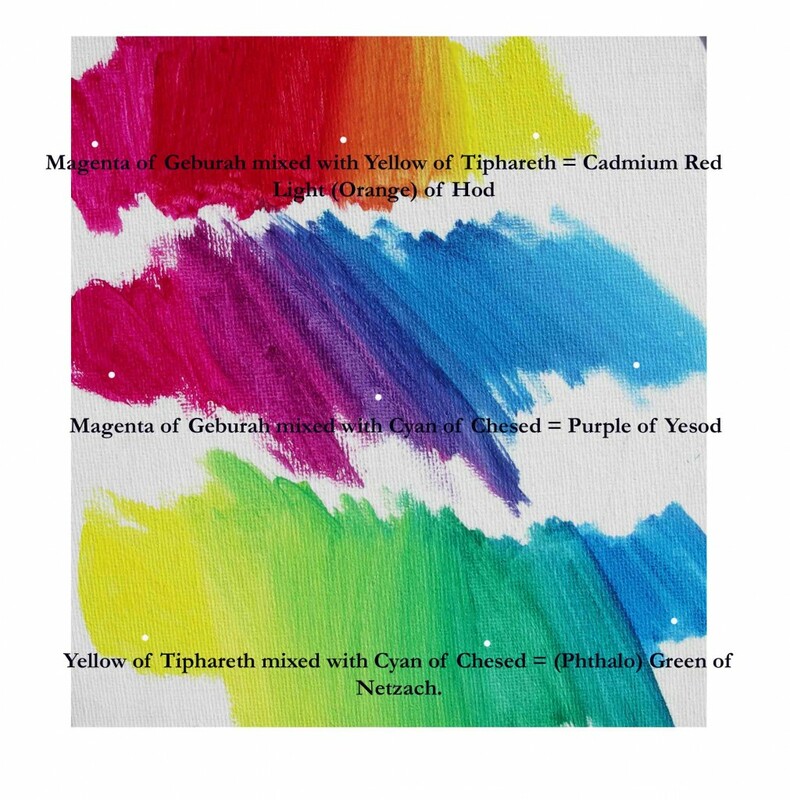 In the past, ‘Red’ was considered a primary colour, however, a modern interpretation of the above quote would render Chesed coloured Cyan, Geburah in Magenta, and Tiphareth Lemon Yellow. Magenta suits the colour of Geburah because of its position on the feminine pillar. Its bold, deep hue has a feminine quality yet it has a power and strength – a strength which it lends to Cadmium Red – remember: Red is a mixed colour, formed from Magenta and Yellow. Of visible light, violet/magenta light has the shortest wavelength and therefore the most energy, whilst red light has the longest wavelength and least energy. Magenta then, having the most energy, fits well with the symbolism of Geburah. Regardie states: “The beams of Geburah and Tiphareth meet in Hod, and yield a tawny orange.” As can be seen in the diagram of colour mixes, the orange of Hod should be a purer, more vibrant orange, coming closer to red than ‘Tawny Orange,’ due to the increased purity of the Magenta of Geburah as opposed to Cadmium Red in the mix with the yellow of Tiphareth. 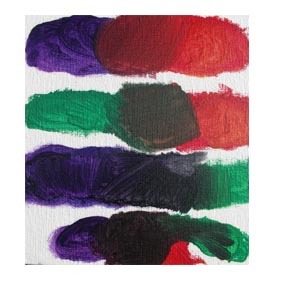 Similarly, the ‘Violet’ produced in Yesod is closer to Indigo than Violet – it is a deep purple, found in the pigment of French Ultramarine.